Uniquely shaped blocks with enchanting patterns inspire building in a whole new way. Problem Solving: Introduces logic, matching, spatial relationships, critical thinking, and an understanding of cause and effect. Fine Motor Skills: Promotes dexterity, hand/eye coordinations, and manipulations. Age: 24+ Months. 26 Wooden blocks. 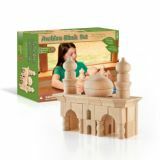 Build great structures from ancient history, or challenge kids to create new architectural works of art. The Starter Set contains 16 different shapes that can be used in conjunction with any of the themed add-on sets for limitless possibilities. Made from rubberwood. Includes storage bag. Ages 3+. 42-piece set. 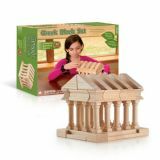 Build great structures from ancient history, or challenge kids to create new architectural works of art. The Starter Set contains 16 different shapes that can be used in conjunction with any of the themed add-on sets for limitless possibilities. Made from rubberwood. Includes storage bag. Ages 3+. 40-piece set. 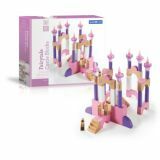 Recreate your favorite princess fairytale story with the Fairytale Castle Blocks! 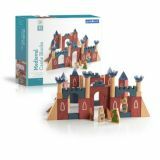 Solid wood blocks in natural wood and pink and purple pastels allow for endless castle possibilities! Translucent, acrylic blocks provide elegance and beauty to each new design. Includes three characters to encourage dramatic play within block construction; prince, princess, and wizard. Set includes 62 pieces. 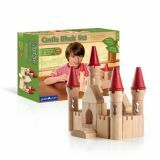 The Medieval Castle Blocks feature a handsome combination of stained, solid wood towers and arches in a red, blue and natural wood coloration. Translucent, acrylic blocks provide grandeur and sophistication to each new design. Implement storytelling into this handsome set with 3 medieval characters: 2 knights and a dragon. Set includes 61 pieces. An adventure in color! Indulge your child's appetite for exploration by combining blocks to form new colors, or stack the blocks in a different order each time to form new and exciting shapes. Smooth hard-wood frames with primary colored plexi windows. Sized to standard unit block measurements. 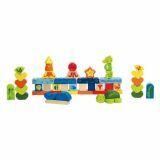 10 block assorted shapes set. 4 rectangle, 2 square, 2 triangle and 2 1/2 circles. Ages 2+. 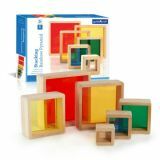 Six hardwood stacking squares feature inset colored plexi for stacking, sorting, building, sequencing and creating imaginative, colorful constructions! 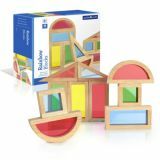 Doubles as a stand-alone manipulative or an addition to hardwood block construction. Hardwood frames, rounded corners and edges, and inset acrylic windows. Largest square measures 7″W x 7″D x 2″H. Ages 2+. 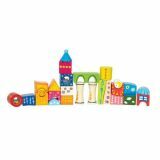 Uniquely shaped blocks and vibrant colors inspire new ways to build and new stories to tell. 48 wooden piece set. Age: 24+ Months.